Acer has released its new light-weight netbook named as Aspire One D250, which features 10.1-inch high brightness CrystalBrite LED backlit display with 1280 × 720 pixel resolution that offers a broader vision for more convenient navigation. The new Acer Aspire One D250 equipped with an 1.60GHz Intel Atom N270 processor, 1GB of DDR2 533MHz, 160 GB internal hard drive, SD card reader and multi-in-one card reader. 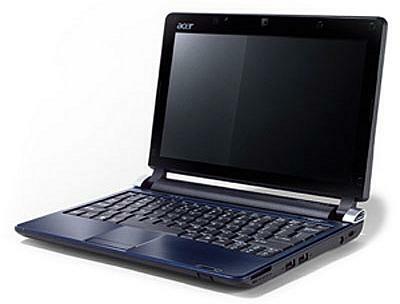 In addition, the netbook comes with 802.11b/g WiFi connection and Acer Signal Up technology for an enhanced user experience. It also comes with Fast Ethernet network card and can also be equipped with Bluetooth or 3G wireless technologies for unlimited connectivity. Furthermore, the Aspire One D250 also integrated Acer Crystal Eye webcam and Acer Video Conference software for video chats to delivers smooth video streaming and high quality images even in low-light environment. The new Acer Aspire One D250 is available in four high-gloss color: seashell white, sapphire blue, ruby red and diamond black. The netbook measures just 258.5 x 184.0 x 25.4 mm and weighs 1.1 kg (including 3-cell battery). Acer Aspire One D250 currently available for pre-order in Norway from starting price of $299 through leading retailer.